A US general and NATO's most senior military commander in Europe said he felt like a “knucklehead” after mixing up the location of the strategically important Ukrainian port city of Mariupol. 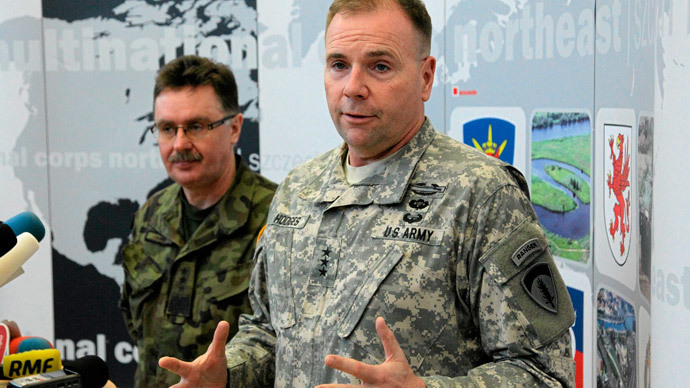 Speaking to the Scottish daily the Herald, Lt. General Ben Hodges said he was “impressed” the paper had “busted” him for not having his geography straight. "I felt like such a knucklehead. You made a great point, it was a little bit professionally embarrassing, so my team had some fun laughing at me." In a recent interview with the Wall Street Journal, Hodges had said the port of Mariupol, where rebel forces launched an offensive on January 24, was on the Black Sea, and not the Sea of Azov. The Sea of Azov is just north of the Black Sea, and is connected by the narrow, 2.5-kilometer-long Strait of Kerch. The comment raised a few eyebrows among Ukraine watchers on social media, though Hodges insists it was just a slip of the tongue. "I felt like such a knucklehead because I am an old person so I love maps and I stare at the maps all the time, and I knew Mariupol was on the Sea of Azov. I was careless or just screwed up," he said. Hodges recently made headlines for announcing the US military would train Ukrainian government forces fighting against militias in southeast Ukraine. His comments came just hours before the start of “Normandy Four” talks in Minsk, where the leaders of France, Germany, Russia and Ukraine managed to hammer out a ceasefire agreement between the two sides. “I am not making a judgment on the quality of agreement,” Hodges said. "What I am going to be judging is the quality off the compliance," he added. On Sunday, France and Germany released a joint statement saying the ceasefire, which had come into effect at midnight, was generally being observed. On Tuesday, the Normandy Four leaders discussed the measures needed to fully implement the so-called Minsk agreement amid an ongoing dispute over Kiev’s besieged military force in Debaltsevo. “The issues of ceasefire, withdrawal of heavy weapons by the sides of the conflict and the situation around the city of Debaltsevo were discussed,” Putin’s office said. The leaders also agreed on specific steps to be taken to enable an OSCE monitoring mission in the area.